My first paper, co-authored with two of my PhD supervisors, was recently published in the Journal of Hydrology. 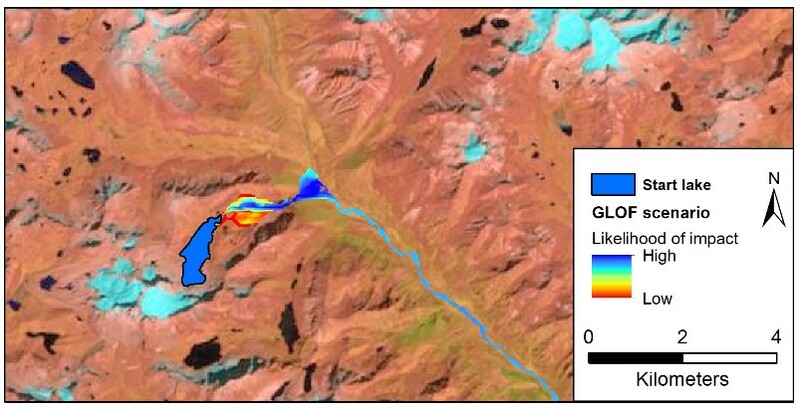 We investigated two commonly used first-past Glacial Lake Outburst Flood (GLOF) assessment techniques (the GIS-based Modified Single-Flow-direction and a 1D hydrodynamic model implemented in HEC-RAS) and proposed an improved GIS-based model, which is distributed along with an example data set in the supplementary information. 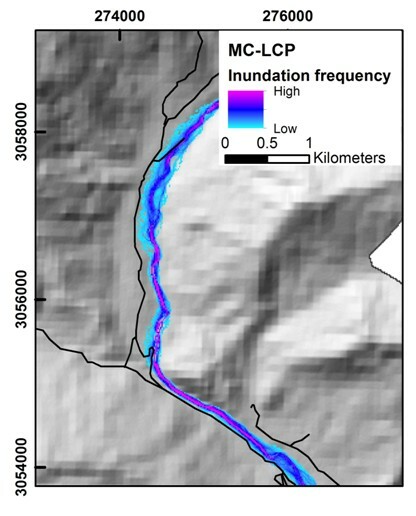 We found that our new model was least sensitive to Digital Elevation Model (DEM) choice and provides a means of assessing relative inundation probability for a potential GLOF event. The incorporation of stochastic DEM uncertainty is important when modelling and communicating assessments of an inherently complex process, especially where socio-economic implications exist. From my Masters dissertation I was aware of the widely used MSF model developed by Huggel et al. (2003) as a first-pass GLOF assessment technique. However the major drawback is the requirement of a 'filled' DEM, which when using coarse resolution DEM products such as the ASTER GDEM or SRTM, can lead to a large proportion of the valley bottom being artificially raised to allow continued downstream propagation. This often leads to parallel flow artifacts where a length of the valley has been raised to the same elevation, which limits its use for evaluating lateral inundation extent. Additionally, assessing the 'likelihood of impact' over long study reaches using the visual output is difficult. To improve downstream flow propagation and negate the requirement of a filled DEM, we proposed and tested a new Monte Carlo Least Cost Path (MC-LCP) model. This model is similarly GIS-based but does not require a filled DEM. In our study we used DEMs processed to balance 'cutting' and 'filling' to remove erroneous peaks and sinks, although this is not a requirement. The model is run iteratively (500 times in this study) and produces a numeric output showing how many times each cell was inundated (i.e considered a least cost path for a potential GLOF flow). This iterative process incorporates a new DEM terrain realisation with each simulation to account for vertical DEM uncertainty and allows relative inundation probability to be evaluated. We identify several ways in which our model could be developed further, but suggest in the current form it performs well as a first-pass assessment technique. Although the model has no physical basis, comparison with the geomorphic evidence of the 1985 Dig Tsho GLOF event showed good agreement. Robust first-pass assessments are important to guide physically-based assessments, but may be the only feasible option in regions where fine resolution topographic data are not available for such physically based hydrodynamic modelling.